UNIVERSITY NEWS | Loyola Marymount University launched Harriet Tubman Press with a high-profile celebration at the Vision Theatre on Oct. 15, in the Leimert Park neighborhood of Los Angeles. More than 300 people, including dignitaries, celebrities, community members and LMU faculty, staff and students, heard poets read from “Voices From Leimert Park: Redux,” the first volume under the Harriet Tubman Press imprint. Shonda Buchanan, left, literary editor of Harriet Tubman Press, Elias Wondimu, publisher of TSEHAI Publishers, Rep. Karen Bass, and moderator Angela Rye discussed community engagement at the launch of Harriet Tubman Press in Leimert Park. Harriet Tubman Press will focus its output on African-American literature and scholarship, making it the only African-American publisher housed at a university in the United States. “LMU is so grateful that Harriet Tubman Press will present African-American writers to the world,” said Lane Bove, senior vice president for student affairs at LMU. 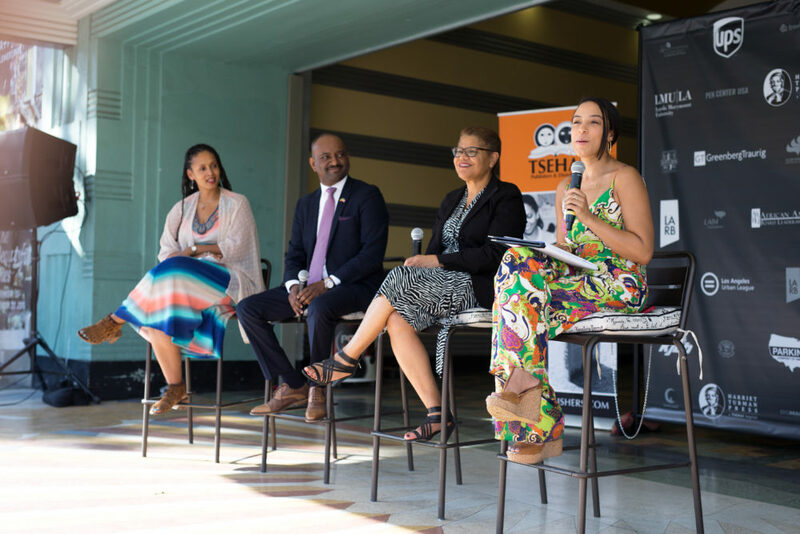 Complementing the poetry readings, Angela Rye, political commentator for CNN and National Public Radio, hosted a series of panel discussions during the afternoon, which included Rep. Karen Bass; L.A. County Supervisor Mark Ridley-Thomas; Rev. Kevin Sauls; and Umar A. Hakim, executive director of Intellect Love Mercy Foundation, and Helen Singleton. LMU professors Robert Singleton and Cheryl Tawede Grills also participated in the panel discussions. Kevin Nash of 102.3 KJLH radio in Inglewood served as the master of ceremonies. Elias Wondimu, publisher of TSEHAI Publishers, the parent of Harriet Tubman Press, described how the first volume by TSEHAI, “Voices From Leimert Park,” began as an idea around the corner from where the crowd was gathered. Wondimu, a journalist in exile from his native Ethiopia, has earned a worldwide reputation for the scholarship and quality of the books under his direction. Connecting the press to the community is among the priorities of Harriet Tubman Press. “Leimert Park wouldn’t be what it is without the poets,” said Shonda Buchanan, literary editor for Harriet Tubman Press. 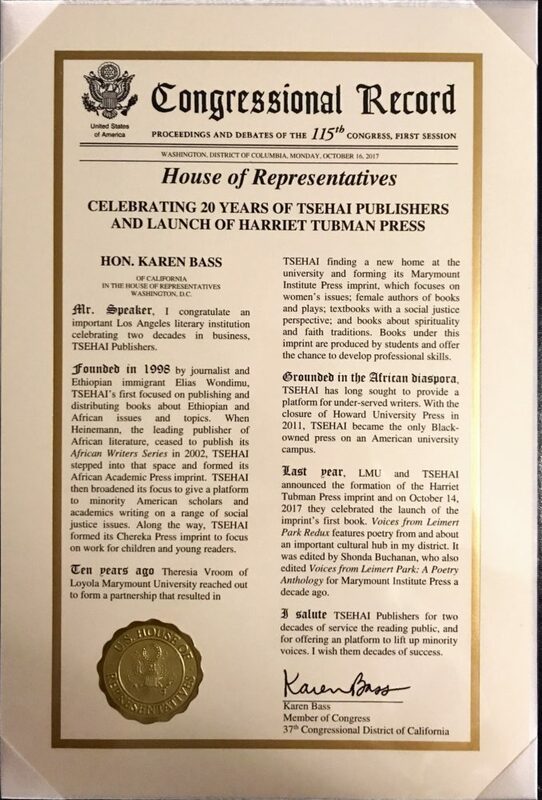 Congratulations to Harriet Tubman Press and TSEHAI Publishers were read into the Congressional Record in this proclamation by Rep. Karen Bass. Before the Saturday launch, Harriet Tubman Press and TSEHAI Publishers were honored with congressional proclamations in Washington, D.C. Rep. Bass signed a Certificate of Recognition, presented to TSEHAI and LMU; she and Rep. Maxine Waters each read proclamations into the Congressional Record; and Rep. Bass signed a Certificate of Special Congressional Recognition to Harriet Tubman Press, on the occasion of its first book publication. The city of Los Angeles also congratulated TSEHAI for its 20th anniversary. The second Harriet Tubman Press volume, “One Sunday in Mississippi,” by Linda Bannister and James E. Hurd Jr., retells the story of three civil rights workers who were murdered in 1963. The play is expected to be published in February 2018. The news program covered the launch party and community event hosted last weekend by the LMU-based publisher. This day celebrated TSEHAI’s 20th Anniversary as well as its 10th Anniversary on the campus of Loyola Marymount University.